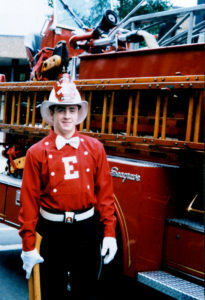 boy at Empire Hook and Ladder, and who now served with New York City’s first marine fire brigade, hosted an evening cruise for several firefighters, including Welles and his father, in June 2001. In August 2001, Welles called his dad to tell him he had decided to change his career. 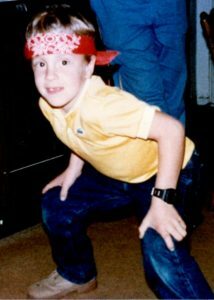 He wanted to be a New York City firefighter, and although it might take years to fulfill his dream, he was “going for it.” Shortly thereafter, Wells was enjoying an evening out with his parents in Manhattan, when his mother spied the bandana peeping from his pocket. She was astounded he not only still had it, but carried it daily. Little did she know this simple red handkerchief would soon serve to symbolize a remarkable young hero. It was no accident that Providence placed Welles where he was needed most, just two days later, on September 11, 2001. Welles was in his office at Sandler O’Neill in the south tower of the World Trade Center that morning. The north tower had already been hit, when United Flight #175 exploded into the south tower. Ling Young was in the sky lobby on the 78th floor when the second plane hit. As the flesh literally burned off her body, she heard a voice command “I found the stairs. Follow me. Only help the ones that you can help, and follow me.” In the stairwell, she turned to see a young man wearing a white tee shirt and red bandana. He carried a woman on his back and a large fire extinguisher in one hand. Welles labored down seventeen flights of stairs before gently putting the woman down and handing the fire extinguisher to someone, declaring “I’m going back up.” Dozens were guided to safety that horrific day by a twenty four year old hero they could only describe by his red bandana. Sadly, Welles perished when the building collapsed, but his courage and character, his bravery and kindness continued to live in the memories and stories told by those he touched. The Red Bandana answers the question “What would you do in the last hour of your life?” It serves as a talisman, a symbol of a remarkable young person of character and courage. 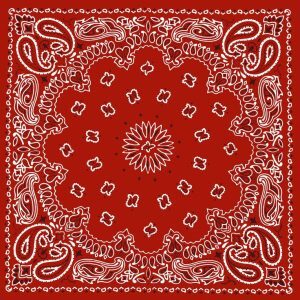 In addition to a tribute to heroism, The Red Bandana is a story of simple gifts, of a bond between father and son. Of a small gesture that meant the world to a boy who wanted to emulate his dad. No one could have predicted how much that red bandana would mean to Welles, just as you have no way of knowing the significance of a gift you bestow can have on another. *As related in Hanky Panky, An Intimate History of the Handkerchief, by Helen Gustafson, in the United States, “show and blow” dates back to the late 1800’s, when children were required to bring a clean handkerchief to school. I’ve been told a similar practice exists in Japan. A small pocket in the left sleeve of the kimono holds a functional handkerchief, while the pocket in the right sleeve contains a beautifully embroidered or colored handkerchief for show. Welles Crowther was the true essence of a Handkerchief Hero. His was a life cut tragically short in the course of it being well-lived. Ann, this was truly a wonderful story about an all American hero and a red bandana. Actually brought tears to my eyes! I am now thinking about what I would like to give my daughters. Thank you for an inspiring story, once again!